The assessment of the social anxiety disorder (SAD) is still a debated issue. The diagnostic tools mostly used to assess SAD cover different aspects, but not exhaustively. Consequently, a list of items that allows both detecting and analyzing an exhaustive set of symptoms needs still a better definition. The aim of the present study is to provide such a list, by means of a new methodology, i.e., the formal psychological assessment (FPA). Two lists were built: the former contained an update set of 17 SAD symptoms, taken from DSM-5, theoretical models and scientific literature; the latter contained 164 items taken from nine well-known SAD questionnaires. By means of formal and logical steps provided by FPA, a final list of forty non-redundant items emerged. Such list exhaustively investigates all the 17 attributes. The relationships among items were also analyzed, providing a model of assessment that could be able to precisely distinguish between patients with a similar score, but two slightly different symptomatology. Finally, the clinical implications of each feature of the found list are discussed, like the possibility of defining an adaptive and computerized assessment based on a questionnaire built from the found list. Acarturk, C., Cuijpers, P., Van Straten, A., & De Graaf, R. (2009). Psychological treatment of social anxiety disorder: a meta-analysis. Psychological medicine, 39(2), 241-254. Acarturk, C., de Graaf, R., Van Straten, A., Ten Have, M., & Cuijpers, P. (2008). Social phobia and number of social fears, and their association with comorbidity, health-related quality of life and help seeking. Social psychiatry and psychiatric epidemiology, 43(4), 273-279. American Psychiatric Association [APA]. (2013). Diagnostic and statistical manual of mental disorders: DSM-5 (5th ed.). Washington, DC: Autor. Arrindell, W. A., Ender, J., Sanderman, R., Oosterhof, L., Stewart, R., & Lingsma, M. M. (1999). Normative studies with the Scale For Interpersonal Behaviour (SIB): Nonpsychiatric social skills trainees. Personality and Individual Differences, 27, 417–431. Binelli, C., Muñiz, A., Sanches, S., Ortiz, A., Navines, R., Egmond, E., … & Subirà, S. (2015). New evidence of heterogeneity in social anxiety disorder: defining two qualitatively different personality profiles taking into account clinical, environmental and genetic factors. European Psychiatry, 30(1), 160-165. Bögels, S. M., & Voncken, M. (2008). Social skills training versus cognitive therapy for social anxiety disorder characterized by fear of blushing, trembling, or sweating. International Journal of Cognitive Therapy, 1(2), 138-150. Bottesi, G., Spoto, A., Freeston, M. H., Sanavio, E., & Vidotto, G. (2015). Beyond the score: Clinical evaluation through formal psychological assessment. Journal of personality assessment, 97(3), 252–260. Brown, E. J., Turovsky, J., Heimberg, R. G., Juster, H. R., Brown, T. A. & Barlow, D. H. (1997). Validation of the Social Interaction Anxiety Scale and the Social Phobia Scale Across the Anxiety Disorders. Psychological Assessment, 9, 21–27. Caballo, V. E., Arias, B., Salazar, I. C., Irurtia, M. J., & Hofmann, S. G. (2015). Psychometric properties of an innovative self-report measure: The Social Anxiety Questionnaire for adults. Psychological assessment, 27(3), 997. Carleton, R. N., Collimore, K. C., McCabe, R. E., & Antony, M. M. (2011). Addressing revisions to the Brief Fear of Negative Evaluation scale: Measuring fear of negative evaluation across anxiety and mood disorders. Journal of Anxiety Disorders, 25, 822-828. Clark, D. M., & Wells, A. (1995). A cognitive model of social phobia. In R. G. Heimberg, M. Liebowitz, D. A. Hope, & F. R. Schneier (Eds. ), Social phobia: Diagnosis, assessment and treatment (pp. 69−93). New York: Guilford Press. Collins, K. A., Westra, H. A., Dozois, D. J., & Stewart, S. H. (2005). The validity of the brief version of the Fear of Negative Evaluation Scale. Journal of anxiety disorders, 19(3), 345-359. Doignon, J. P., & Falmagne, J. C. (1985). Spaces for the assessment of knowledge. International journal of man-machine studies, 23(2), 175–196. Doignon, J. P., & Falmagne, J. C. (1999). Knowledge spaces. Springer Verlag. Donadello, I., Spoto, A., Sambo, F., Badaloni, S., Granziol, U., & Vidotto, G. (2016). Ats-pd an adaptive testing system for psychological disorders. Educational and psychological measurement, 0013164416652188. Erwin, B. A., Turk, C. L., Heimberg, R. G., Fresco, D. M., & Hantula, D. A. (2004). The Internet: home to a severe population of individuals with social anxiety disorder? Journal of anxiety disorders, 18(5), 629-646. Falmagne, J. C., & Doignon, J. P. (2010). Learning spaces: Interdisciplinary applied mathematics. Springer. Fehm, L., Beesdo, K., Jacobi, F., Fiedler, A. (2008). Social anxiety disorder above and below the diagnostic threshold: Prevalence, comorbidity and impairment in the general population. Social Psychiatry and Psychiatric Epidemiology, 43 (4), pp. 257-265. Filho AS, Hetem LAB, Ferrari MCF, Trzesniak C, Martı´n-Santos R, Borduqui T, et al. (2010). Social anxiety disorder: what are we losing with the current diagnostic criteria? Acta Psychiatr Scand, 121(3), 216–26. Ganter, B., & Wille, R. (1999). Formal concept analysis: mathematical foundations. Berlin Hedelberg: Springer Verlag. Garcia-Lopez, L. J., Sáez-Castillo, A. J., Beidel, D., & La Greca, A. M. (2015). Brief measures to screen for social anxiety in adolescents. Journal of Developmental & Behavioral Pediatrics, 36(8), 562-568. Glass, C. R., Merluzzi, T. V., Biever, J. L. & Larsen, K. H. (1982). Cognitive Assessment of Social Anxiety: Development and Validation of a Self-statement Questionnaire. Cognitive Therapy Research, 6, 1, 37-55. Heimberg, R. G., Hofmann, S. G., Liebowitz, M. R., Schneier, F. R., Smits, J. A., Stein, M. B., … & Craske, M. G. (2014). Social anxiety disorder in dsm‐5. Depression and anxiety, 31(6), 472-479. Heimberg, R. G, Liebowitz, M. R., Hope, D. A., Schneier, F. R., Holt, C. S., …, Klein, D. F. (1998). Cognitive Behavioral Group Therapy vs. Phenelzine Therapy for Social Phobia: 12-Week Outcome. Arch Gen Psychiatry, 55, 12, 1133–1141. doi:10.1001/archpsyc.55.12.1133. Leary, M. R. (1983). Social Anxiousness: The Construct and its Measurement. Journal Personal Assess, 47, 66. Leary, M. R. & Kowalski, R. M. (1993). The Interaction Anxiousness Scale: Construct and Criterion-related validity. Journal Personal Assess, 61, 136. Liebowitz MR. Social phobia. Mod Probl Pharmacopsychiatry. 1987;22:141-173. Mattick, R. P. & Clark, J. C. (1998). Development and Validation of Measures of Social Phobia Scrutiny Fear and Social Interaction Anxiety. Behavioral Research and Therapy, 36, 455–470. McEvoy, P. M., & Saulsman, L. M. (2014). Imagery-enhanced cognitive behavioural group therapy for social anxiety disorder: A pilot study. Behaviour research and therapy, 55, 1-6. Morrison, A. S., & Heimberg, R. G. (2013). Social anxiety and social anxiety disorder. Annual Review of Clinical Psychology, 9, 249-274. Mörtberg, E., Reuterskiöld, L., Tillfors, M., Furmark, T., & Öst, L. G. (2017). Factor solutions of the Social Phobia Scale (SPS) and the Social Interaction Anxiety Scale (SIAS) in a Swedish population. Cognitive behaviour therapy, 46(4), 300-314. Miloyan, B., Bulley, A., Pachana, N. A., & Byrne, G. J. (2014). Social Phobia symptoms across the adult lifespan. Journal of affective disorders, 168, 86-90. Rapee, R. M., & Heimberg, R. G. (1997). A cognitive-behavioral model of anxiety in social phobia. Behaviour Research and Therapy, 35, 741−756. Rodebaugh, T. L., Woods, C. M., Thissen, D. M., Heimberg, R. G., Chambless, D. L., & Rapee, R. M. (2004). More information from fewer questions: the factor structure and item properties of the original and brief fear of negative evaluation scale. Psychological Assessment, 16, 169–181. Serra, F., Spoto, A., Ghisi, M., & Vidotto, G. (2015). Formal psychological assessment in evaluating depression: A new methodology to build exhaustive and irredundant adaptive questionnaires. PLoS ONE, 10(4). Serra, F., Spoto, A., Ghisi, M., & Vidotto, G. (2017). Improving Major Depressive Episode Assessment: A New Tool Developed by Formal Psychological Assessment. Frontiers in Psychology, 8, 214. Skocic, S., Jackson, H., & Hulbert, C. (2015). Beyond DSM-5: An alternative approach to assessing Social Anxiety Disorder. Journal of Anxiety Disorders, 30, 8-15. Spoto, A., Bottesi, G., Sanavio, E., & Vidotto, G. (2013). 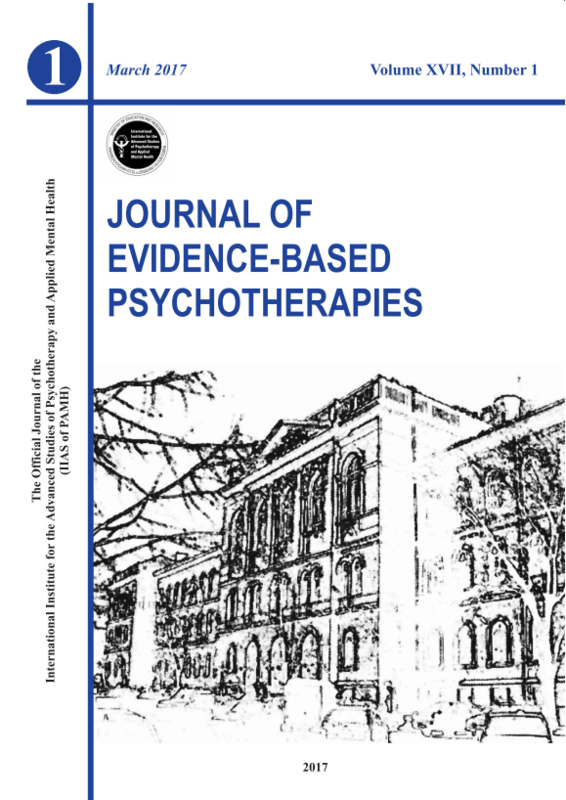 Theoretical foundations and clinical implications of formal psychological assessment. Psychotherapy and psychosomatics, 82(3), 197–199. Spoto, A., Stefanutti, L., & Vidotto, G. (2010). Knowledge space theory, formal concept analysis, and computerized psychological assessment. Behavioral research methods, 42(1), 342–350. Stuhldreher, N., Leibing, E., Leichsenring, F., Beutel, M. E., Herpertz, S., Hoyer, J., … & König, H. H. (2014). The costs of social anxiety disorder: the role of symptom severity and comorbidities. Journal of affective disorders, 165, 87-94. Watson, D., & Friend, R. (1969). Measurement of social– evaluative anxiety. Journal of Consulting and Clinical Psychology, 33, 448 – 457. Wadsworth, L. P., & Hayes-Skelton, S. A. (2015). Differences among lesbian, gay, bisexual, and heterosexual individuals and those who reported an other identity on an open-ended response on levels of social anxiety. Psychology of sexual orientation and gender diversity, 2(2), 181. Wallace, S. T., & Alden, L. E. (1997). Social phobia and positive social events: The price of success. Journal of Abnormal Psychology, 106(3), 416. Weeks, J. W., Heimberg, R. G., Fresco, D. M., Hart, T. A., Turk, C. L., Schneier, F. R., et al. (2005). Empirical validation and psychometric evaluation of the brief fear of negative evaluation scale in patients with social anxiety disorder. Psychological Assessment, 17, 179–190. Weeks, J. W., Jakatdar, T. A., & Heimberg, R. G. (2010). Comparing and contrasting fears of positive and negative evaluation as facets of social anxiety. Journal of Social and Clinical Psychology, 29(1), 68-94. Wille, R. (1982). Restructuring lattice theory: An approach based on hierarchies of concepts. In I. Rival (Ed. ), Ordered Sets (pp. 445–470). Dordrecht: Reidel. The relationship between rumination and executive functions: A meta-analysisWhy do we keep failing in identifying reliable biological markers in depression?